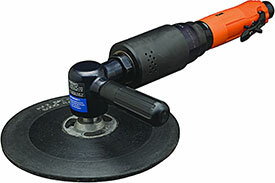 Dotco 12-42 Series Buffer/Polisher features a high output motor for the most demanding applications. The Dotco 12-42 Series Buffer/Polisher also features a comfortable and ergonomic composite handle and includes an auxiliary handle for optimum operator control. The 12L4206-80 Dotco 12-42 Series Buffer/Polisher, 5/8''-11 External Thread is one of thousands of quality tooling products available from MRO Tools. Please browse Dotco 12-42 Series Buffers/Polishers for tools similar to the 12L4206-80 Dotco 12-42 Series Buffer/Polisher, 5/8''-11 External Thread. 12L4206-80 Dotco 12-42 Series Buffer/Polisher, 5/8''-11 External Thread description summary: Dotco 12-42 Series Buffer/Polisher Termination: 5/8'' - 11 External Thread Free Speed (rpm): 6,000 Abrasive Capacity: 9''(225mm) Sanding Disc Type Housing: Composite Weight: 6.4lbs Overall Length: 13.6'' / 345mm Head Height: 3.90'' Air Inlet Size: 1/2'' Quantity discounts may be available for the 12L4206-80 Dotco 12-42 Series Buffer/Polisher, 5/8''-11 External Thread. Please contact MRO Tools for details.